I first came across Marie Byles while travelling through northern India visiting the significant sites where Buddha had lived and taught, the famous Bodhi tree at Bodh Gaya being among them. My experience was enhanced by reading a book Footprints of Gautama Buddha about Buddha’s life told through the eyes of one of his disciples. Reading this story in the places where the historical events unfolded helped me to relate to Buddha as a real human being while absorbing the energy that still exists in these sites after 2500 years. I had no idea that the author of the book that had so greatly enhanced my experience was Australian. On my return to Sydney, I read a newspaper article about Marie Byles that publicised an open day at her home that she had gifted to the National Trust before she died in 1979. The property, Ahimsa, named for Gandhi’s principle of non-violence, illustrated much about the woman who was an influential environmentalist as well as being the first female solicitor to practise in New South Wales. When I visited Ahimsa and spoke with close neighbours I discovered there were multiple facets to this woman who had lived the most remarkable life. The more I learnt about Marie (pronounced Mah-ree) the more compelled I felt to continue my research by delving into her papers stored in the Mitchell Library. She had written prodigiously: six published books and unpublished manuscripts, letters, diaries and many newspaper articles she had written on her various fields of interest. I became absorbed in her adventurous life through reading her accounts of bushwalking and mountain climbing expeditions published in the monthly journal of the Sydney Bush Walkers Club and the annual journal of the Federation of Bushwalking Clubs NSW, that she edited. I managed to interview a range of people who had known Marie –her fellow bushwalkers as well as her colleagues in the legal profession, including her first partner in 1932 and some of the staff who had worked at her law practice in Eastwood from the 1930s–60s. 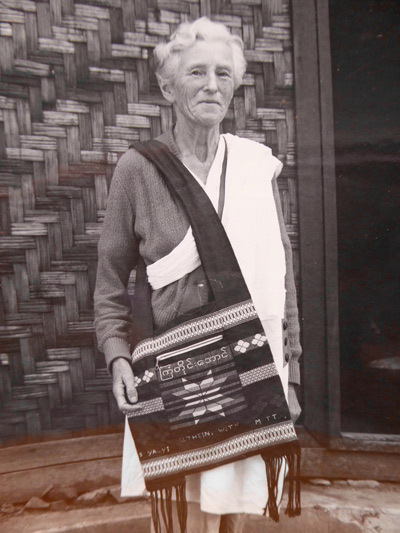 It became a fascinating and rewarding process of delving into her personality and illuminating her conflicts while I gained an education in the struggle for women's rights as well as the history of the conservation movement and the introduction of Buddhist meditation into Australia. Marie’s life story covers many of the movements that are so relevant today.